Okay, so I spent the last two weeks doing books that are far afield of my usual wheelhouse. Well, I’m back this time with some pulp sci-fi that’s sure to please. I know it pleased me. I was thrilled with this book. 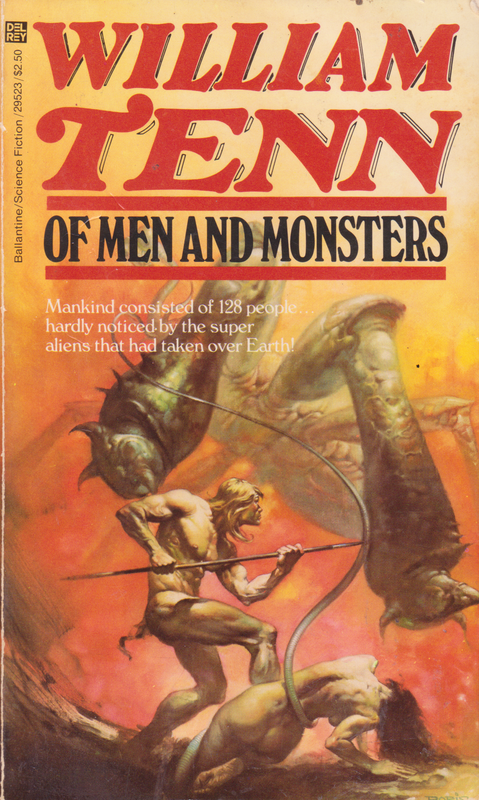 First off, there’s that Boris Vallejo artwork that is quite often the surest sign you’re going to find of a novel that’ll rock your world. I dare you to contest that. You’d…probably be right. But I stand by it this time. I mean, if you excised the shapely woman’s bottom and sideboob, you’d have what is basically the perfect science fiction cover art, especially for this book. William Tenn is a pseudonym of Phillip Klass. This is his only novel. Most of his work appeared in the mags, novella-length or shorter. Indeed, this novel itself is based on his 1963 “The Men in the Walls,” which appeared in Galaxy. It’s been a good long while since I’ve come out and called something absolute dreck. This is starting to worry me. Perhaps I need to reboot my reading taste buds somehow. Regardless, this book was the opposite of absolute dreck. I’d go so far as to say it’s masterful. Yes, there are a few bits and pieces here and there that I’d quibble with, but on the whole, this was one of the best pieces of science fiction satire that I’ve read outside of Norman Spinrad. And unlike Spinrad, William Tenn was being funny. Nothing against Spinrad―he’s got important things to say and I love the way he says them―but there’s also something to be said about satire that’s coming from a place of affection, too. This book feels much like the latter. Our hero is a guy named Eric the Only. He earned his sobriquet by being an only child. See, in this future, it’s become important for women to bear as many children as possible. At once. Having sextuplets is considered great. Eric, as the only child of his litter, is not quite an outcast, but he is an object of some scorn. Nevertheless, he’s keen to earn a real name for himself. The book starts on the eve of his test of manhood, his first Theft. So here’s the real meat-and-potatoes of this book. At some undefined point in the past, Earth was invaded by aliens. These aliens are huge. I don’t think we’re ever given a proper measure of them. At an early point in the book, Eric sees a Monster (humanity’s name for the aliens) and the narration describes it as taller than a hundred people. Play with those numbers and you have aliens that are around five or six hundred feet tall, although there’s reason to doubt that our narrator is especially reliable at this point, seeing as how this was his first encounter with a Monster and he was scared out of his wits. Still, the book makes it seem that we are about the same size to them as, say, rats or roaches are to us, and it works. Humanity survives in the walls and furniture of the Monsters. There are various tribes and, by necessity, the tribes fulfill different caste functions. Eric’s tribe, which calls itself Mankind, exists right on the border between human territory and Monster territory, in the shallowest of the burrows. Mankind’s job is to go out into Monster territory and steal food and technology to bring back. These things are traded with the lower burrows, considered by Eric’s people to be soft and weak, although we later learn that they’re the ones developing technology and plans for saving humanity. Eric’s first Theft is a solo affair. Later he’ll be part of a party, but this first one is all by himself. Just before he heads out, he learns that his uncle (Eric’s parents are dead), Thomas the Trap-Smasher, is a follower of “Alien-Science,” which is a major no-no in this society. The true path is “Ancestor-Science,” which most people believe that, once rediscovered, will help humanity reclaim Earth for itself. Thomas doesn’t believe that at all. He figures that Ancestor-Science failed to stop the Monsters from coming to Earth in the first place. What good would it do them now? This revelation comes as a complete shock to Eric. He also learns that his belated parents were also believers in Alien-Science, and that he is expected to follow in their footsteps. Eric’s first Theft, then, is to be of an alien artifact that his people can study and perhaps learn from. It turns out that his uncle has arranged the whole thing in advance. All Eric has to do is go out into Monster territory, meet some people who will give him this artifact, and then come back safely. It all works out pretty well. Once returned, though, it seems that things have gone bad. Thomas the Trap-Smasher has been captured, his hunting band scattered or killed, and he is to be executed for believing in Alien-Science. Eric learns this once he gets back home, where he gets captured as well. The bit of alien tech that Eric received was a sort of ball of red goo that, when spat upon, explodes. Eric manages to use that to free himself and his uncle, but his uncle doesn’t make it. Eric disposes of him in the sewer, as has been done since time immemorial. Right off the bat we’ve got this amazing premise. Humans are vermin living on the spoils of gigantic aliens. I absolutely love this. I guess it’s kind of like the Borrowers or the Littles, except in this case the humans are normal-sized and the things they’re mooching off of are gigantic. The satire comes from the idea that these “mighty deeds” done by the hero are little more than coming out of hiding, creeping around a bit, and nabbing bits of garbage that the homeowners dropped. It’s not a ha-ha sort of satire―it’s all very straight-faced―but I found myself laughing occasionally, usually after I’d put the book down for a minute and think about what I’d just read. Eric hooks up with some Strangers, his tribe’s word for anybody who isn’t a part of the tribe, and follows them around. He’s been outcast from Mankind, so there’s no way he can go back home. He meets up with another member of his tribe, Roy the Runner, and they join a band run by a guy named Arthur the Organizer. I really like that everybody in this book has regular names. It saves me time. So often I’ve sat down to write a review and had to consult the book again because I can’t remember if the main character’s name was spelled Rralhu or Rallhu. There’s a bit of wandering around before the troupe gets captured by some Monsters. The Monsters are using some kind of sticky rope thing that we later learn is based on “protoplasm attraction” or something like that. Everybody is put into a transparent box. They are brought food and water every day. There is no escape. Another captive in this cage reveals the truth of the situation: they’re currently in a pest-control lab. Folks are being experimented on to determine how humanity might best be eliminated like the pest it is. Eric witnesses several people being removed from the cage and dissected or experimented on. It’s pretty gruesome. Eric himself is pulled out of the cage. He expects to die soon and resigns himself to that fate. Instead, he’s placed into another cage with a woman. The woman attacks him at first, but as he defends himself she comes to realize that he’s not some kind of Wild Man from outside the walls. Her name is Rachel and it’s clear that they were placed together so that the Monsters could observe human mating habits. That does happen eventually, but first it’s revealed that Rachel comes from a group of people almost as far back into the burrows as you can get: the Aaron people. The Aaron people have the highest technology that anybody knows about. They’re scientists, engineers, etc. Eric becomes aware of the sheer number of things he doesn’t know about, and asks Rachel to teach him what she can. She happily obliges. Eric soaks up knowledge like a sponge. Before long, the two of them fall in love. After a while, Roy the Runner is placed into the cage, too. Apparently the Monsters figured that the mating wasn’t working out. The three of them devise an escape plan. It works. They escape back into the burrows and head for Rachel’s people. On the way there they discover some of the other front burrow tribes have been exterminated by some kind of poison. The trio arrives at the home of the Aaron people. It turns out that the Aaron people are highly advanced, and it turns out that they’re on the verge of the great idea that will save humanity. The leader of the folks, called the Aaron, explains in great detail what makes humanity special. Unlike other science fiction novels where it turns out that our grit or our desire to learn or whatever is the key to human survival, it turns out that the idea here is that our greatest strength is one we share with roaches and rats: adaptability. We’ll eat practically anything, live practically anywhere, and have no problems taking what we didn’t produce and using what we didn’t earn. We’re the highest form of vermin in the universe. The Aaron cites the fact that there are probably more human beings alive on Earth right now than ever before. We’re really good at living in the walls and floorboards. So the great plan is as follows: there’s a Monster spaceship, a cargo hauler, about to lift off. It’s on the roof of the very building where they currently live. (It’s established that there are other buildings, and that humanity has started to diverge genetically since the populations have been isolated for so long.) The Aaron people, now including Eric and Roy, are going to sneak on board. They aren’t going to take it over, oh no. They’re going to do exactly what they’ve been doing since the Monsters arrived: hide and survive. They assume that since Monsters have the same basic requirements that humans do―we eat the same food, have roughly the same temperature and gravity requirements―that humanity can survive anywhere Monsters can. So, like rats on grain ships, we’re going out into the universe. Hot damn, that’s a good ending. I don’t often get to see endings that I like as much as I like this one. I think the thing I liked most about this book is that while the entire point turned out to be that the best role humans can fulfill is that of parasitic vermin on gigantic monsters, I didn’t feel like that lesson was necessarily mean-spirited. Ignoble, yes. We’re not destined to conquer the universe by technology or sheer bloody-mindedness like maybe we always thought we were, but hey, is there anything wrong with being the best rats on the block? I mean, some of the closing lines are “My people, henceforth the universe is ours!” That’s a pretty nice ending. Humanity will survive and thrive. Will it dominate? No, I guess not. But what good is trying to dominate when there are aliens a hundred times our size, that don’t even acknowledge us as intelligent, running around? We’ll just stick with what we’re good at and eventually there will be trillions upon trillions of us running around, stealing space-grain and bein’ human. I guess the ending of this book probably wasn’t supposed to be so uplifting, but that’s how I found it. I really enjoyed it. Accuse me of being cynical―you’d be right―but in the end I think the idea that humanity can survive with some modicum of comfort in an otherwise hostile universe is a nice one. The book wasn’t perfect, of course, but in the end I really really liked it. Characterization was a little bit flat and there were times when conversations seemed to go on for far too many pages with nothing else happening, but in the end, I think those sins can be overlooked in favor of just enjoying an original story, well told. Look for this one. I think you’ll enjoy it. A fine writeup of a novel that I too remember enjoying a lot. It’s worth noting, perhaps, the similarities between this — and perhaps more pertinently Tenn’s original story, published 1963 — and the tv series Land of the Giants, which ran 1968-70. I remember for a long while this being one of the books people came to Usenet group rec.arts.sf.written because they remembered the premise but had no idea who the author was or what the book was. Many years ago, I remember coming across a novel with a similar premise. All I remember is the title: “Men Like Rats”. I prefer Tenn’s short stories, but this novel seems pretty good too. I remember “Men Like Rats” on the stands many years ago. You might want to scare up a copy for Schlock Value review.